Last week, I confessed that I have been culinarily uninspired. And this continues to loom over me like a grey cloud threatening rain. Or an uninvited guest that refuses to leave. Honestly, I am unsure whether I should just go with the flow or fight this dreaded spell with all I’ve got. Yes, my refrigerator is filled with cucumbers, green beans and kale. A gorgeous eggplant is waiting to be sliced and five tomatoes are ripe and ready to become tomato sauce. Several butternut squash are wondering why they continue to wait their turn, but I am not interested. So I wait patiently for that yearning feeling and urge to return to my favorite room in the house–the kitchen. While waiting, I have managed to whip a few things up for us to eat just so we are not starving. In my attempt to beat this virus, I have been spending quite a bit of time researching completely nonsensical food ideas and have, in the process, learned a new trick. In my futile attempt to avoid dairy, I have been learning about the myriad uses of coconut milk. From curry to soups, rice to sauces, stir fries to ice cream and lots of desserts, coconut milk is a great staple to keep in the pantry. I made a completely decadent, yet sugar-free and dairy-free chocolate pudding a few months ago that disappeared in no time. 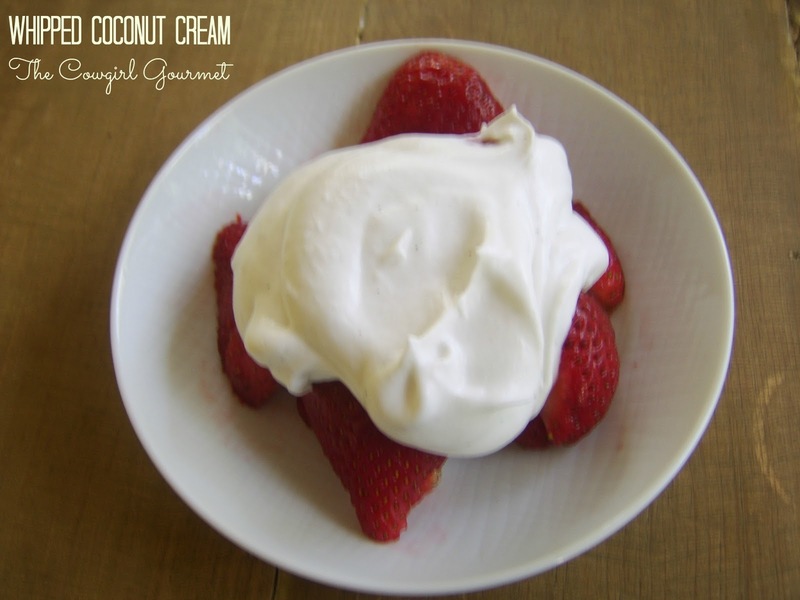 One thing you may not know, however, is that you can use coconut milk to make an amazing whipped cream. True story. And it’s a dairy-free whipped cream that is utterly divine. Just place a can of organic coconut milk in the fridge overnight, scoop out the congealed coconut milk and whip it for about five minutes. I think you’ll be as impressed as I was with the results. Creamy, rich, decadent and vegan whipped coconut cream. This may be just what I need to get over my cooking slump. If you are looking for an alternative to the traditional, dairy laden whipped cream, you may think you've died and gone to heaven when you make this. Only use organic, full fat coconut milk for this recipe--just put the light stuff back on the shelf. It won't work since it's the fat that you are going to whip. Coconut milk has multiple health benefits and the fact that it tastes incredible is, well, icing on the cake. Place the can of coconut milk in the fridge and let it sit overnight to thicken up. About 20 minutes before you want to whip up your coconut milk, place the mixing bowl and beater(s) in the freezer so they, too, get cold. When you are ready, remove the can, flip it upside-down and open the can. At the top, you'll see the coconut water. You'll want to pour this off and save it for smoothies or just drink it. What's left is the solidified coconut milk. Now remove the bowl and beaters from the freezer. Scoop out the solidified coconut milk and place it in the bowl. Beat the mixture on medium speed for a minute and then increase to high speed for about three minutes until it gets light and fluffy. Add the sugar and vanilla and continue beating for another minute or so. The cream is ready when it thickens and holds a nice soft peak. Do not over beat. Using a rubber spatula--so you get every last little drop--transfer the coconut cream to a storage container and chill for 2 hours until it firms up. Serve with berries, over a crisp, cobbler cake or any way your little heart desires. Any leftovers will keep in the fridge for up to a week. It will stiffen up in the fridge, so just whip it again when you're ready to use it. Other flavor ideas: You can turn the whipped cream into a chocolate whipped cream by adding cocoa powder, add espresso powder and turn it into a coffee cream. Previous Post: « Ever Bean in a Food Slump? Oooo, this is the recipe you told me about. I'm going to have to try this!